Lunchbox Dad: 3 Simple Ways to Change Your Family's Daily Eating Habits for the Better! 3 Simple Ways to Change Your Family's Daily Eating Habits for the Better! This is a sponsored post in partnership with FAGE. All opinions are my own. As a busy family, we are always looking for ideas to make our lives easier, less complicated, and more efficient. During the day each hour is seemingly filled to the brim with practices, homework, and dishes. I don't think I've ever met a parent who has told me, "wow I have just been so bored with nothing to day this entire week!" 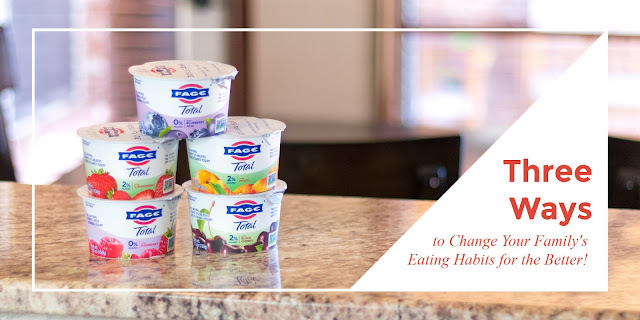 Thanks to FAGE Total Split Cups yogurt, our family has been able to find little ways to change our eating habits to fit our busy lifestyle, so I thought that we would share these tips with you. You can find FAGE at your local store, just use the handy locator HERE. Now if only FAGE could find a way to do laundry, our life would be set! Every parent knows that mornings are one of the most stressful parts of the day. There never seems to be enough time to get the kids dressed, fed, and out of the house in time for school. We won't even talk about us as parents not having more than thirty seconds to put ourselves together before we load everyone into the minivan. 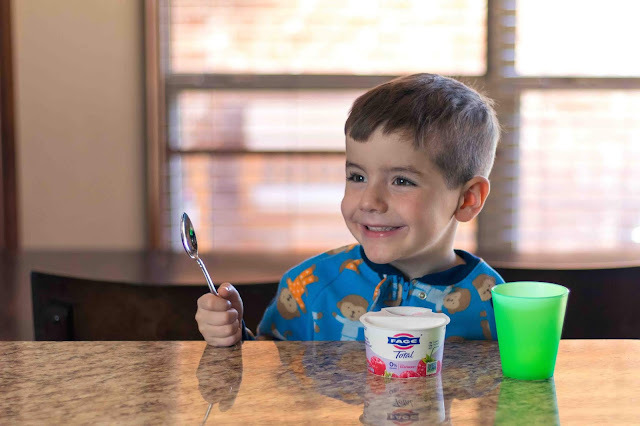 This is why FAGE Total Split Cups have saved mornings for us! 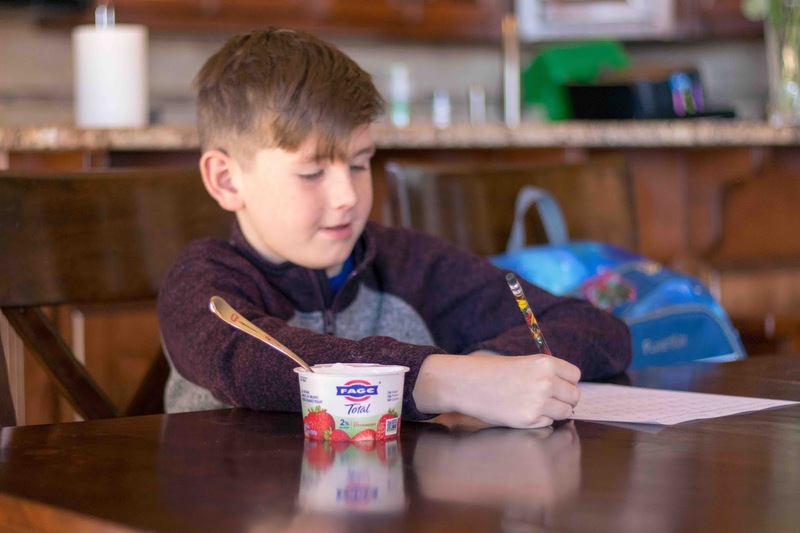 We just grab some out of the fridge and let our kids use the convenient fruit compartment to choose how much they want to mix in with the yogurt. However, the best part is FAGE Total Split Cups now have 30% less sugar! Less sugar and less time on breakfast is definitely a win-win. Is there ever a day where the kids don't walk in after school and yell, "I'm hungry?" I swear 85% of parenting is listening to your kids asking if they can have a snack. When it comes to snack time, we like to have the food be portable and provide tons of choices. You never know if you will be at home or trying to entertain your youngest while you both are at your oldest's basketball practice. Grab and go is the name of the game here. Once again, this is why we must have a supply of FAGE Total Split Cups as one of the options for our family. There are so many flavors available that our kids never get tired of them. One day it's raspberry, the next it's peach, and next week it will be blueberry-acai. Trust me, your kids will want this yogurt to be in the snack rotation also! Let's be honest. After a long hard day of parenting, all we really want to do is hit the pantry and reach for cookies right? Or maybe your way of unwinding is a nice bowl of ice cream? As I get older, I realize that those nighttime dessert habits just cause morning regrets. Because of this I'm always looking for great alternatives to stuffing my face with candy at 10pm at night. Not that I'm advocating eating late at night, but sometimes you just have to reward yourself. When I just need that one delicious dessert, I try to make better choices. This is why I've found that FAGE Total Split Cups hit the spot while we binge watch our favorite shows at night. Not only do they now have 30% less sugar but I can choose from 5%, 2%, or 0% fat varieties. The best part is they are still just as rich and creamy as before! Pro tip: You don't want to pass on Black Cherry, it's my favorite! So these are three of the tips that we have found to be super helpful for our family, and not to mention help us keep our sanity. So do your family a favor and pick some up the next time you're at the store. You know, when you're running between the dance recitals, birthday parties, and science projects. Dr. Seuss Lunch and Recipe Ideas!